Water helps de-stress you. Stress taxes all your basic body systems, and when you’re dehydrated, the effects are magnified. Because more than half your body weight is water, it doesn’t take more than a slight reduction in your hydration to have a dramatic impact on both energy and cognitive function. Dehydration raises the levels of the stress hormone cortisol as well, so even if you think you aren’t thirsty, drinking water will help cope with stress. Water helps you lose weight. In a 2010 study of adults aged 55 to 75 drank two 8-ounce glasses of water before meals. On average they lost four pounds more over 12 weeks than a control group who ate a similar diet but did not drink water beforehand. Water is filling, so you eat less. 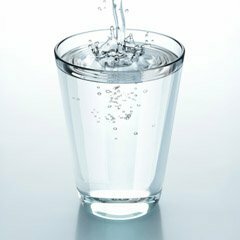 In another study, individuals who drank water before meals consumed an average of 75 fewer calories per meal. Make that twice a day over a year, and that could add up to 14 pounds! You’ll be less likely to become sick. Hydration keeps your mucus membranes in top working order – important because they are the gatekeepers that keep out cold and flu viruses. When these tissues dry out, germs penetrate to the nasopharynx where the nasal passages and mouth meet. You’ll be more comfortable. Water helps regulate body temperature. The body’s temperature-regulating system, governed by the hypothalamus in the brain, makes adjustments to maintain a fairly steady core temperature. Hot sun? You’ll sweat to cool down. Hatless in snow? The hypothalamus will know you’re losing heat through your head and work to produce extra energy, such as shivering. These mechanisms work poorly when you’re dehydrated. Dehydration is a common risk in winter as well as summer. Many people tend to drink less water in cold weather because they don’t think they need it as much as on hot days. It will help regulate your blood pressure. In 2010, the American Red Cross discovered that when blood donors were given 16 ounces of water to drink before giving blood, there was a 20 percent drop in fainting after the procedure. Researchers at Vanderbilt University noticed that drinking water activated the parasympathetic nervous system — related to the “fight or flight” system. This makes you more alert, elevates blood pressure momentarily, and boosts energy. Fainting after donating blood is often connected to a drop in blood pressure. Water can counter that effect. Conversely, not drinking enough water on a regular basis can also raise blood pressure. That’s because dehydration causes blood vessels to constrict as the body strives to conserve water. When blood vessels constrict, however, the heart pumps harder, bringing blood pressure up.